We arrived at Cathedral Gorge before lunchtime in order to increase our chances of getting a campsite. We had cut it a bit close yesterday. When we got to the park the campsite was pretty empty, so we had our choice of spots to choose from. After claiming a site we did a quick hike at Kershaw-Ryan State Park (not impressed), ate a picnic lunch on the lawn there, drove to Pioche for coffee and then returned to camp. It was still windy as hell and my foot still hurt, so you can imagine how awesome my mood was when it came time to take another walk. We bundled up and set out for the Nature Loop, a half-mile interpretive trail. I could handle that. The trail was pretty meh but the Cathedral Caves were filled with unexpected treasures. One note before the trail report: the signage at Nevada State Parks is absolutely ridiculous. The maps are gorgeous. But the table of data on every sign has so much superfluous information it’s almost laughable. No one visiting the park who’s heading out on a 1-mile loop needs to know information like “maximum cross slope,” “typical surface firmness (in inches, of course)” and “typical tread width.” WTF? Maybe this information is useful in internal documents, but not on a public-facing sign. Distance and elevation gain is pretty much all that’s necessary. But wait, the tables don’t even list elevation gain? I really couldn’t understand the impetus for such a sign. And they’re in every Nevada State Park we’ve visited. In an age when people’s eyes glaze over if they have to read a sign that says “pack it in, pack it out,” I can’t imagine anyone is understanding the information overload on these signs. Okay, rant over. I had originally become interested in this park after seeing a photo in a AAA magazine. I was mesmerized by the colors and shapes carved into the unusual rock here. But that is all I knew about the place. 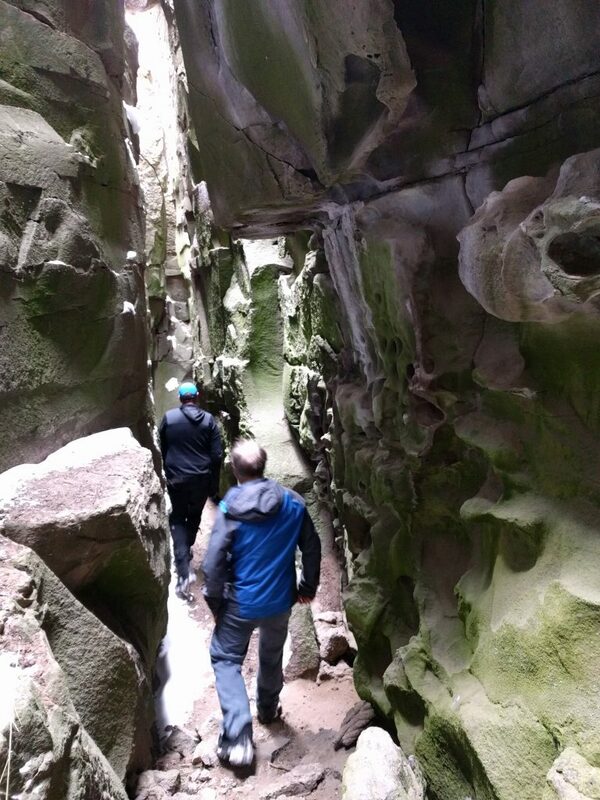 What we discovered were tall, narrow hallways that burrowed into the fluted rock formations. Called “caves,” these passageways were unlike anything I’d seen before. The “rock” didn’t even look like rock, but like flaky, delicate piles of mud. It looked as if a single rainstorm would wash it all away. The passages were just barely wide enough for us to walk through. None were terribly long, but they were really fun to explore. You’d walk in a few yards, hit a dead end, turn around. Some of them had branching passages to explore. At each hallway terminus it felt like you could say, “beam me up, Scotty!” and be taken to another dimension. A side benefit was that the caves offered complete protection from the wind, which we were reminded of every time we stepped out into the open. They were so cool! We spent quite some time oohing and aahing over the geology before trudging back to the campsite. It was so insanely windy that I holed up in the tent while Aaron prepared dinner, and we ate inside the tent, too. It was going to be another long night. The wind blew hard all night long. In the morning, the air was quiet but cold. After breakfast we each enjoyed hot showers in the campground before taking a walk on the Juniper Draw Loop. Along the way we saw jackrabbits and lizards. No snakes. I couldn’t believe I was on the tail end of a two week desert trip and I hadn’t seen one single rattlesnake. It feels like the only people who see rattlers are the ones who don’t want to see them. We walked slowly around the loop. I was keeping my fingers crossed that my foot wouldn’t act up today. I didn’t want to push it. Looking down I noticed cryptobiotic soil. I’d first learned about this phenomenon on a visit to Utah a couple years prior. Between the rocks, the microbes, the animals, plants and weather there was a lifetime of science stuff to geek out on here. But we weren’t done yet. Near the end of the loop we came across more of those “caves.” Some of them were signed: Canyon Caves, Moon Caves. They were nearly identical to the ones we’d explored yesterday. But there were some passageways that led uphill, providing a view looking down into the thin hallways. I was terrified up there, as if at any moment the ground beneath me could collapse. We hurried back down to the safety of the floor and continued on our way. By now, my ankle was hurting. I got grouchy again and made a beeline for the car. Despite the foot injury I felt like we made a good effort to see this park. While the colors weren’t as impressive as the (probably photoshopped) images from my AAA magazine, the experience was just as delightful as I’d hoped it would be. This entry was posted in Hiking, Nevada, Southwest sampler and tagged hike366 on June 15, 2018 by Jess B. By some miracle, we rolled into Snow Canyon State Park sometime in the afternoon of April 11 and managed to snag the last available campsite. It was about a thousand degrees outside and we had one scraggly tree near our site. It wasn’t the best, but at least we didn’t have to keep driving. Besides, there were some hikes I wanted to do here. After a little nap in the tent we packed up for a couple of short hikes to stretch our legs. My foot was really hurting after yesterday’s adventure in Buckskin Gulch. I didn’t notice it until I woke up this morning and could barely stand up. I had a rip in my left foot at the base of my big toe that prevented me from walking without a limp. And here I thought my feet held up great after a day of barefoot canyoneering. Wrong. This was possibly one of the most disappointing hike of the trip and it’s all because we were spoiled in some sweet slot canyons already. Plus, there was a loud (but surprisingly small) group ahead of us whose sole purpose of visiting the park was clearly shouting their life stories across the valley. Fun. I have a bit of a soft spot for park interpretive trails with brochures. This was one of them. Plus, it gave me an excuse to stop at every numbered sign and read about the vegetation and animal life in the park. We slowly meandered along this trail, enjoying the learning opportunities and stopping breathlessly underneath every shade tree. I could never live in Utah. We drove up to the northern-most trailhead in the park and set out on a trail to the White Rock Amphitheater. It was a quick but beautiful walk to the natural amphitheater set in a movie-like backdrop of white sandstone. By now the sun was low enough in the sky that the air felt comfortable. A light breeze blew by and we had this place all to ourselves. Now I was starting to settle in here. Despite my angry foot I managed to scramble up the slickrock to the high point above the bowl because, duh, it was there. Aaron was on a mission to find a desert tortoise, so we pretended to look for one at every little patch of sand and shrubs along the hillside. We didn’t find one, but we did see some pretty agave and cacti. It was quite breezy and cool up top; I could have stayed here awhile. But our hungry bellies were ready for dinner so we hauled back out of there. Back at camp, we grilled up some pork chops and asparagus. The camp host walked past and warned us about high winds and rain coming through tonight. We thanked her, finished our meal and collapsed in the tent. So there was some wind last night. It was blowing so hard I got probably an hour of sleep. Several times I woke up to stick my feet up on the tent ceiling to help bolster the poles. I’d never seen my low-profile backpacking tent get pushed around so much! It was nuts. And since we were in the desert, we woke up with a thick layer of sand on everything in the tent. And in our mouths and noses. And, yeah you get the point. It was a miserable night. We packed up and got right in the car. We took one more walk in Snow Canyon at the Petrified Sand Dunes. The wind was still blowing, the sun was barely up and the air was surprisingly chilly. I layered up for this walk. The trail crosses petrified sand dunes, which look like any other slickrock hill I’ve ever been on. There were funky trail markers drilled into the rock for the start of the hike, but after seeing about three of them we never saw another one. We meandered around on the rock until we felt like we’d seen enough, turned around and looped back towards the parking area. My foot was still really angry so I had to walk very carefully and slowly, not an easy thing for me to do. I struggled with feeling so inept at walking but I tried not to let it get me down. The wind didn’t help my mood. 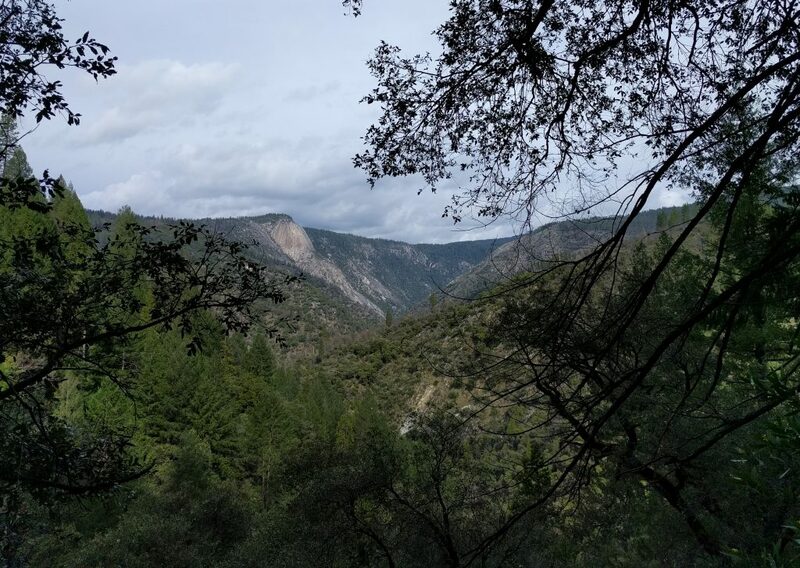 This entry was posted in Hiking, Southwest sampler and tagged hike366 on June 12, 2018 by Jess B. Last night’s campsite was the most spectacular of the trip. It’s really something when taking a chance works out in your favor. Having never been in this area before, it felt like a bit of a crapshoot. Nevermind all that Internet research, there’s still something unsettling about pulling up to a foreign place for the first time. But we nailed it. Where did we stay? Well, let’s just keep that a secret. What I will say is that doing your research ahead of time sometimes pans out. And sometimes you just stumble across the perfect spot. It’s up to you to plan your trips (or not) the way you want to. Some things, I think, are better left to the imagination. Ah, so that explained the excitement. I read the sign and sure enough, this trailhead did provide the access point for the Wave. If you’ve ever seen a picture of the American Southwest, you’ve seen this picture. It became such a popular area that there are now limited entry permits required to visit it. With my disdain for both permits and popular hiking spots, the Wave was not on the top of my to-do list. Instead we were heading for another slot canyon, the longest in the southwest. Unlike yesterday’s hike, I knew we wouldn’t reach the end of it. But I wanted to see how far we could get. Unsure of the trail conditions, the temperature inside the canyon and the water situation, I had trouble figuring out what to pack. I read that there would be some sections of standing water we’d have to wade through so I wore sandals. I figured it might be cooler inside the slot so I packed my fuzzy yellow fleecy top. And I knew we’d need lots of snacks and water so of course I packed all that. 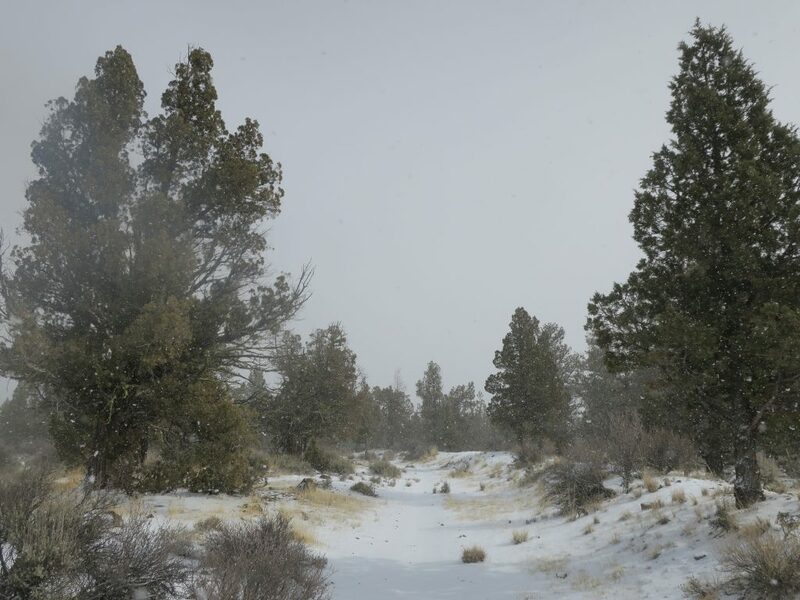 The trail began as a path in a broad wash lined with shrubs and wildflowers. There were other people walking ahead of us, their WAVE permits dangling from their backpacks. We turned a corner, passed through a dry slot, scrambled down a vertical channel and popped out into a large canyon with tall, steep walls. There were a couple of groups of people sitting at the edge of this canyon, where it joined up with Buckskin Gulch. One man walked up to me, asked where I was heading and shook his head. “You can’t get through there, the canyon is filled with thigh-deep mud.” I thanked him for the beta and kept walking towards the canyon. I had to see for myself. We reached the canyon mouth and turned right, heading for the narrow section that I’d read about. Just a short ways into the gulch we reached some mud. Then deep puddles of water. Very quickly, my shoes came off. And I’d keep them off for the entire day. In some sections, the pools of water were avoidable. The canyon bottom was wide enough, and had a mud bar to one side, so that I could skirt the edge of the water. But in other places the canyon was so narrow that I had to walk right into the water. It was ankle deep. Knee deep. Over the knees. Oh yes, there was thigh deep…water, not mud. This was totally passable! And a grand adventure. We decided to keep going. The day went like this: walk a bit on the mud, approach the next pool, gingerly test how deep the pool was, hike up shorts accordingly. Occasionally stop to adjust layers, as in put MORE clothes on. It was damned cold down there, which was especially weird considering it was probably 90 degrees outside the canyon. Little sunlight was able to penetrate the deep and narrow canyon, so it was like we had entered a completely different world. The interior of the canyon also looked otherworldly. Rocks were eroded in unique shapes and patterns. Flash flooding had created holes, pockets and channels into the stone. The canyon bottom exhibited a wide range of textures, going from fine sand to smooth boulders to sharp pebbles, all in the blink of an eye. The sun, when it reached the canyon floor, created interesting shadows and silhouettes. I stopped to take a picture at least every 3 minutes, thinking, I’ll never see this again! We were walking through the slot for so long it felt like it would never open up. As soon as we got a small widening in the gulch, we plopped down to have a much-needed snack. Just a few minutes after we sat down, we heard voices. People?! Who would choose to walk through this water and sludge? A couple appeared, wearing sandals, tank tops and shorts. They asked “Does this go to the Paria River?” Well yes, I thought, but that’s like 10 miles away. I informed them of this, then turned to reach into my bag for the map. When I turned around, they were already gone, retreating back the way they came. Well, that was odd. Who would have walked this far into a challenging hike with no sense of where they were or where they were going? We pressed on, again the only people in the canyon. Right around the next corner the canyon opened wide and we felt the warm rays of the sun. Aaaahhh! It was wonderful. But now we really got a sense of the size of the canyon. The walls to either side of us rose straight up, hundreds of feet. We felt tiny inside of this massive split in the earth. Since the canyon was so wide, it was now easier to avoid the slick mud and deep holes filled with water. It gave us an opportunity to dry our feet out and walk on soft ground. At some point we reached a point in the canyon that was choked with boulders and debris. It wasn’t clear which way was the best way to get around it, so I picked a side and went. There may have been a handful of climbey-type moves on less than stellar rock but we both made it over just fine. And kept walking. “When should we turn around?” Aaron asked. Oh, do we have to?! We both thought simultaneously. We looked at the time, selected a hard turnaround time and continued on. I was mesmerized by the experience and already planning a return trip. How cool would it be to backpack the entire Paria Canyon? And I’m not even a backpacker! At x-o’clock in the afternoon, I don’t remember what time, we decided it was time to turn around. I really didn’t have a sense of how far we had come, since the GPS on my phone was wildly inaccurate inside of a canyon. And while it felt like we had walked 20 miles, in reality we assuredly hiked much less! On our way back, I stopped to take fewer pictures, but I was no less in awe of the place we were in. Each fold in the rock, each groove in the mud, each bundle of debris and each shadow on the water was a spectacular moment to be cherished. I just didn’t need to capture it on camera. We had almost made it back to Wire Canyon when we began to hear voices again. Another couple was heading our way. We chatted with them a bit, and they seemed excited about their adventure. They knew how late in the day it was and it sounded like they were planning to turn around soon. After stepping out of that last puddle of water I breathed a sigh of relief. While Aaron washed his feet and put his shoes back on, I found a place to sit just off the trail. OUCH. Every plant in this damn place is covered in spines! I carefully found another seat and savored a few moments of quiet rest. There wasn’t another soul in the canyon. The rest of the hike was uneventful, but my feet were pretty sore. Every little pebble and sticker sent sharp pains through my body. I put my sandals back on. Feet, you’ve had a long day. Upon arriving at the car before sunset, I took a moment to reflect on a day well spent. Adventure is there for those who are willing to grab it, and I was grateful to have a partner who put his trust in me to find a new trail and was all in to give it a shot. This entry was posted in Hiking, Southwest sampler and tagged hike366 on June 8, 2018 by Jess B. We rolled into Valley of Fire State Park around 9 am. Immediately we were sitting in line, waiting to pay the entry fee to get into the park. To be fair, it was Easter weekend, which is apparently one of the most popular weekends in the park. Our first objective was grabbing a campsite and dropping our stuff so we could go out hiking for the day without wondering where we’d spend the night. 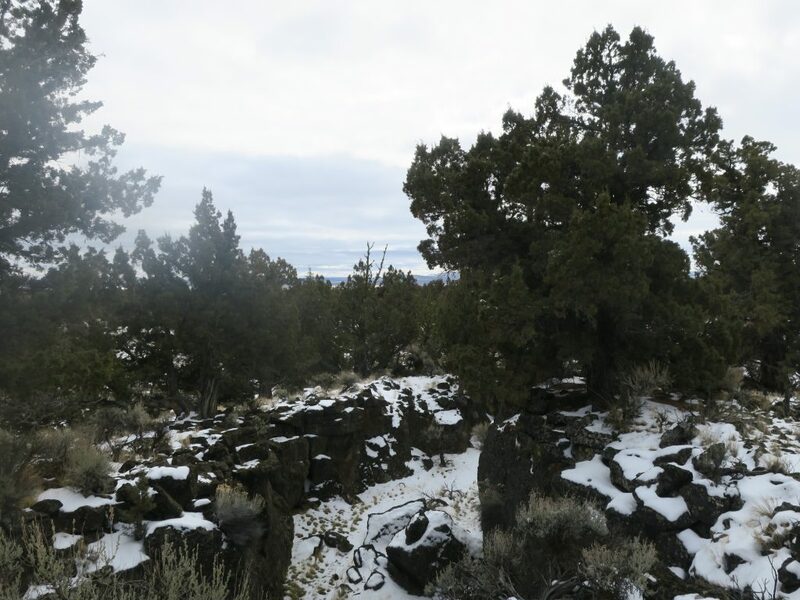 We drove through Arch Rock Campground and secured a site. Then we drove up White Domes Road to check out several short hikes. A quick stop at the Visitor’s Center was less helpful than I’d imagined. There was no map to buy (they were out!) and the ranger seemed pretty uninterested in making hike recommendations. I took a bunch of pictures of the posted hiking map and we went on our way. First stop: Mouse’s Tank. There was a raging party going on across the street at a picnic area, with tons of people, radio blaring, kids yelling… We were glad to hit the trail and disappear around a corner back into quiet. The hike was lovely, following a gentle wash. There were pictographs on the vertical rock walls along the trail. At the end, we reached Mouse’s Tank, a pool of water that allegedly kept a Paiute nicknamed “Mouse” alive while he was hiding from the law. There wasn’t a great viewpoint of the tank itself. We even scrambled up the rock above it to see if we could get a better look. Nope. This short walk was a good way to get acclimated to the desert weather and get up close to the red rock walls. Next up: Rainbow Vista. This was another short hike that led to a canyon overlook. There were lots of pretty cacti and rocks, but what I most enjoyed was seeing the chuckwallas! I’d been itching to see a chuckwalla in the wild ever since our trip to Death Valley several years ago. Aaron spotted the first one. It was sunning itself on a rock. Then, he found another one on the same rock formation. And another. They had staked out this rock as a cozy chuckwalla condo. There was even a sentry sitting at the very top! We watched these cool creatures for a while before continuing along the route. The rock here was all different colors: red, yellow, white. At the end, there was a pretty viewpoint. And if we’d had the time maybe we would have scrambled down into the canyon to explore. But there was one other trail head on my agenda. By the time we made it to the White Domes trail head it was about lunchtime. It was pushing 90 degrees and I was feeling pretty low energy. We made up a lunch and found some shade to sit and eat. There were people milling around everywhere. But I had a plan. 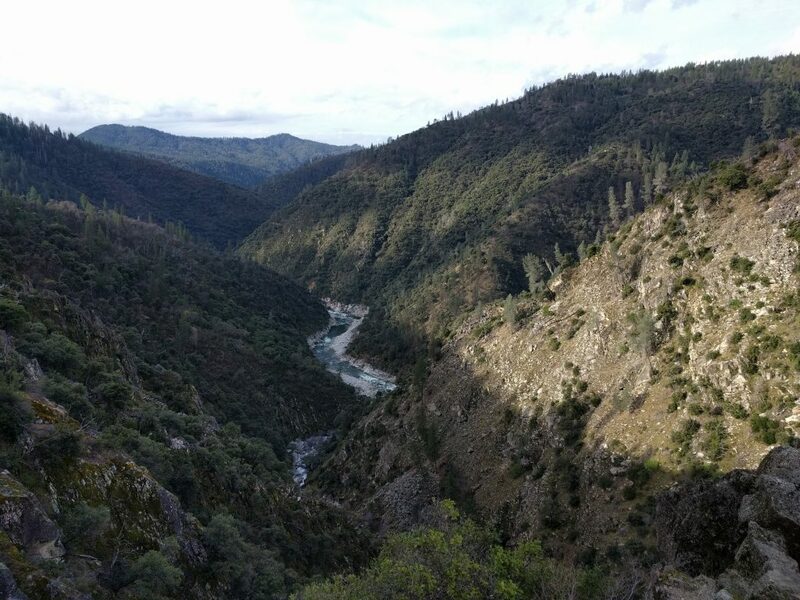 The White Domes Loop, a popular, mile-long hike, connected to a trail that the ranger recommended: Prospect Trail. We walked the east side of the loop, past an old movie set and into a slot canyon. Then we kept our eyes peeled for a sign. When we found it, we were delighted at what it said: 5.5 miles to main road, not maintained or marked. PERFECT. We wandered down a wash, through another mini-slot and then into the open. The trail on the map looked like it followed the canyon, so we tried to stay roughly on route. But it was so tempting to explore. It was very hot, and shade was at a premium, so we didn’t make it too far back there. But we had enough time to do some hiking in the wash, up on the slickrock and into some nooks and crannies. We saw one other couple hiding out in the shade, but that’s pretty much it. The views were incredible. There were so many rock colors; colors I’d never seen before. No people, no noise, just the rocks and lizards and big blue skies. On our way back we saw some flagging and decided to follow it to the White Domes Loop. This route was far more tedious than the route we had chosen but we stuck with it anyways. Once on the trail we walked quickly from one shady spot to the next, admiring the various types and colors of rock along the way. It sure was a stunning location and no wonder this trail was so popular. On our way back to camp we stopped back in the visitor’s center, which had run out of cold drinks (of course) so we just wandered around in the A/C until our body temperatures dropped back to normal. Before calling it a night we made two more stops: Petrified Log and Elephant Rock. Neither were that spectacular, or maybe that was the heat stroke talking. We passed by a mother who was encouraging her two sons to climb on Elephant Rock so she could take a picture. And to my utter amazement, one of the boys pointed to the sign that said “please do not climb on rock” and said he wasn’t comfortable doing that. BRAVO, KID! Back at camp, we got ourselves all set up and prepared to cook dinner. In the meantime, a band of kids kept running back and forth through our campsite to climb on the rocks behind us. And their parents were doing the same. For the rest of the night we got to listen to one of the obnoxious dads howling like a wolf, followed by the chorus of kids howling back from all over the camping area. Father of the year. It would have been an absolutely beautiful place to camp if not for that one group of inconsiderate people. The rest of the camp was pretty quiet. 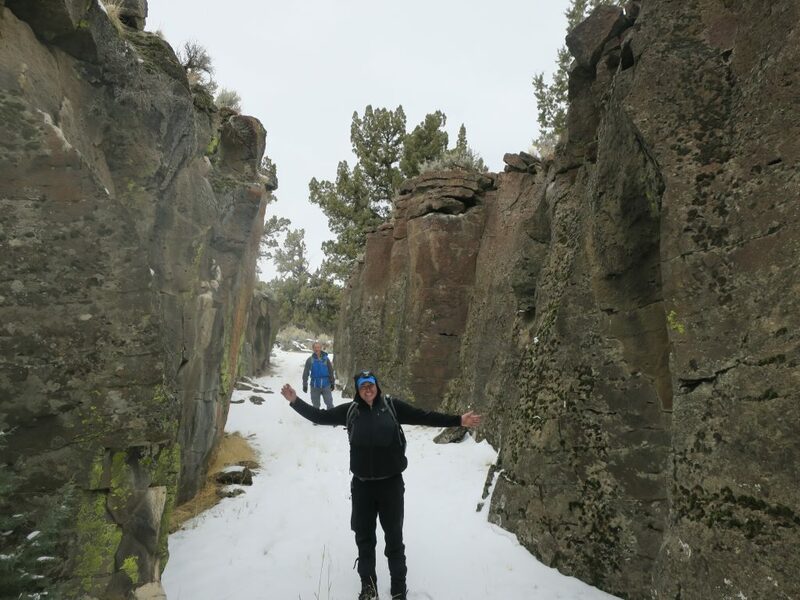 This entry was posted in Hiking, Nevada, Southwest sampler and tagged hike366 on April 25, 2018 by Jess B. 6 mi. | 800′ ele. gain | 3:15 hr. 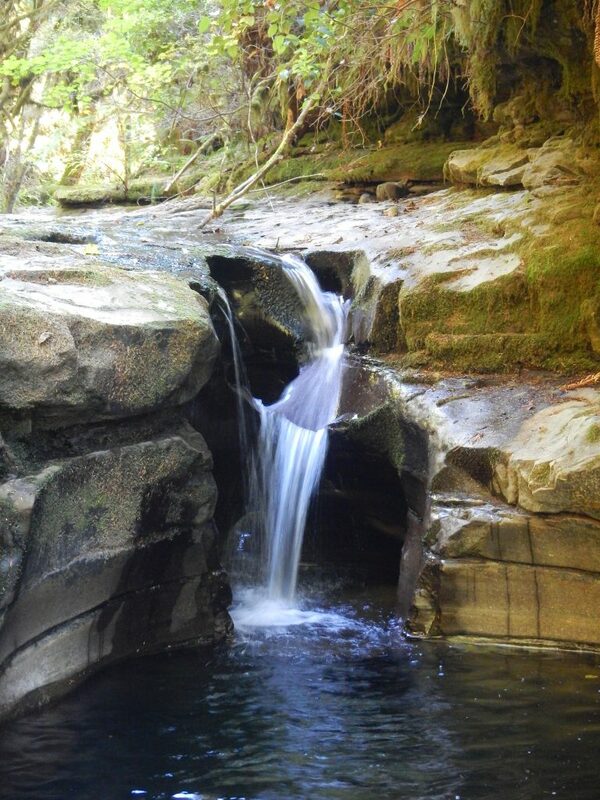 To find this remote series of waterfalls, it was necessary to negotiate a network of poorly marked (or unmarked) logging roads. It was an exercise in following directions precisely! I was by myself, had no cell service and was miles from any civilization, so you can imagine my relief when I pulled into the parking area. Sigh, I made it. The Kentucky Falls trail was a thin ribbon of brown dirt enclosed by a lush, coastal forest. There was greenery everywhere: trees climbing towards the sky, lichen dangling from every available branch, mosses and ferns blanketing the ground and shrubs squeezing through the soil in search of sunlight. 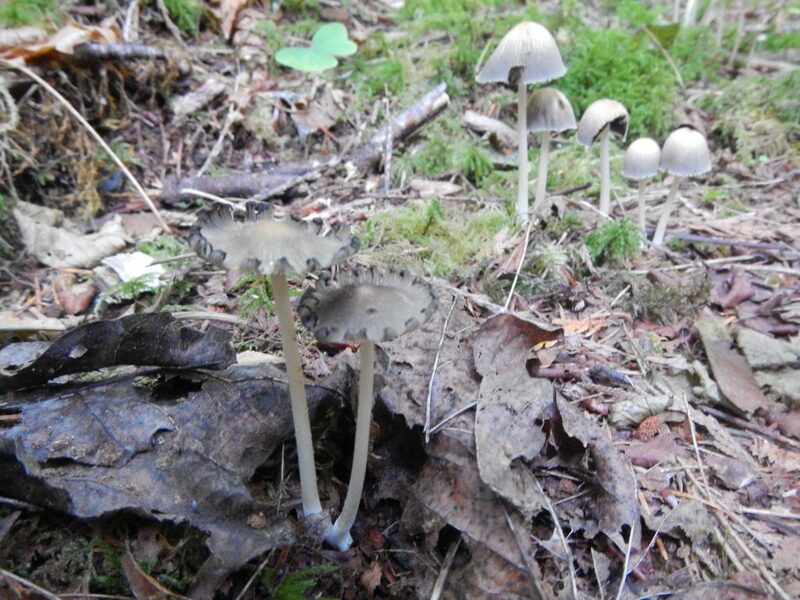 It was a magical, fairyland forest. Quiet, too. Not surprisingly, there were no other cars out here today. I was truly alone in the woods. A feeling I enjoy but don’t get to experience too often. The river was absolutely beautiful. Moss-covered boulders lay strewn throughout the water. 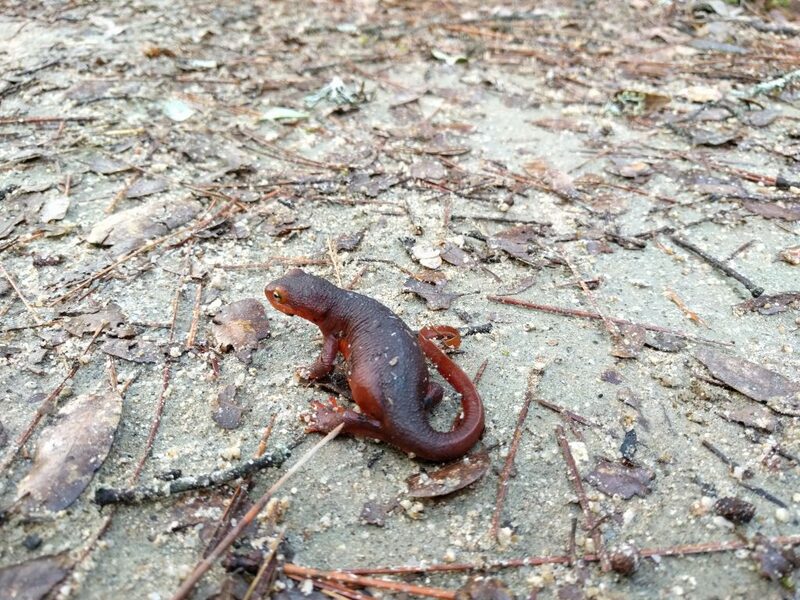 Newts, slugs, snails and bugs crawled about the forest. This was a place full of life and color. In just under an hour of walking, I arrived at the epic viewpoint with two lovely waterfalls pouring down steep, rocky cliffs. 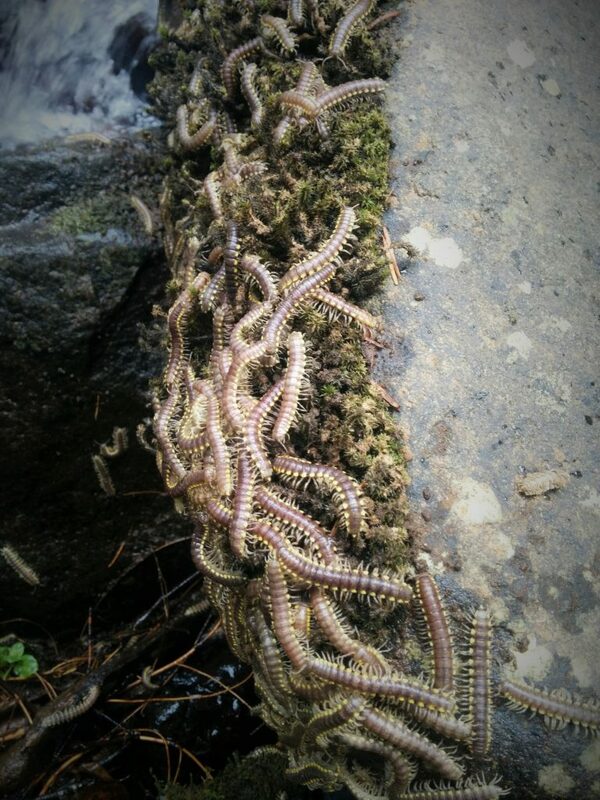 I wasn’t alone here; there was a massive colony of millipede-looking bugs on nearly every surface they could cover. At first I just saw a few. Okay, no big deal. But then, hundreds. Thousands. Squirming, writhing, being bugs. It is so bizarre to me how a few of a thing can be cool and interesting but thousands of the same thing is horrifying and disgusting. Besides bunnies, maybe. Thousands of bunnies in a big bunny pile? Probably still cute. I stood there for a while, angling for all the perspectives I could get of the two waterfalls, while avoiding the throbbing masses of millipedes. But I didn’t just come here for an hour of hiking. I decided to press on a bit further. 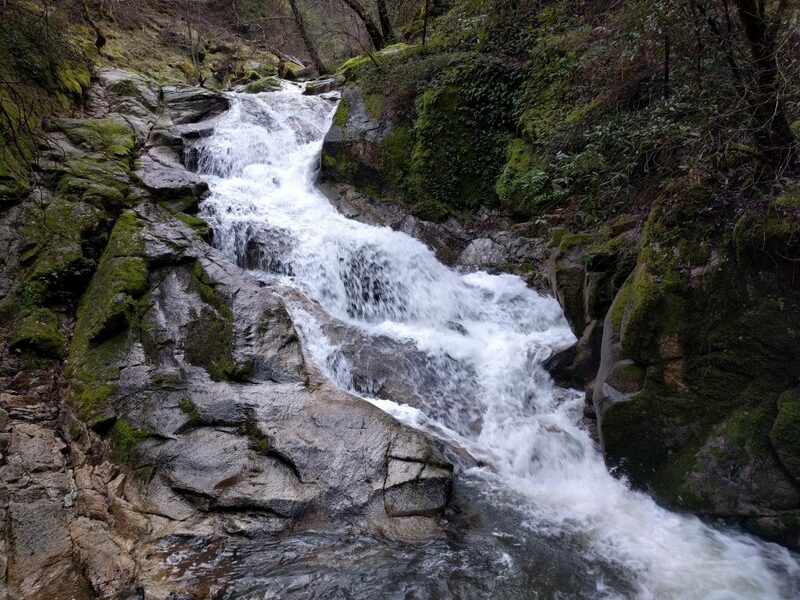 I continued on the North Fork trail past the waterfalls and into an even lusher, richer world. The path felt a bit more rugged and closed in here. In places, huge fallen tree stumps were covered in moss, creating tall green walls on the side of the trail. 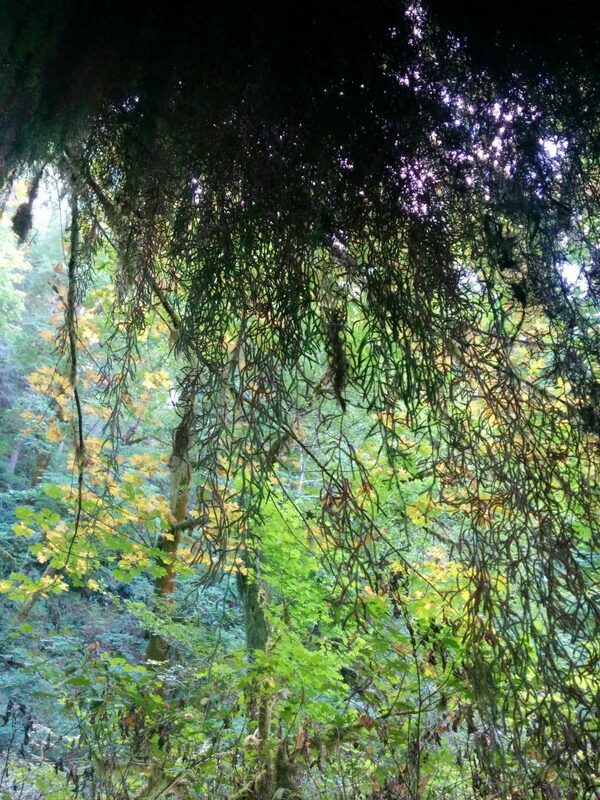 I pushed through curtains of dangling lichen as if I was entering a mystical temple. And then, mushrooms. So many mushrooms! The diversity in this short stretch of trail was astonishing. Oh, Oregon coast range, you never disappoint. But the final gem had yet to be discovered. I walked a bit further and caught a glimpse of the river through the thick trees. I continued until I found an easy way to get down to the river. And there I found paradise. 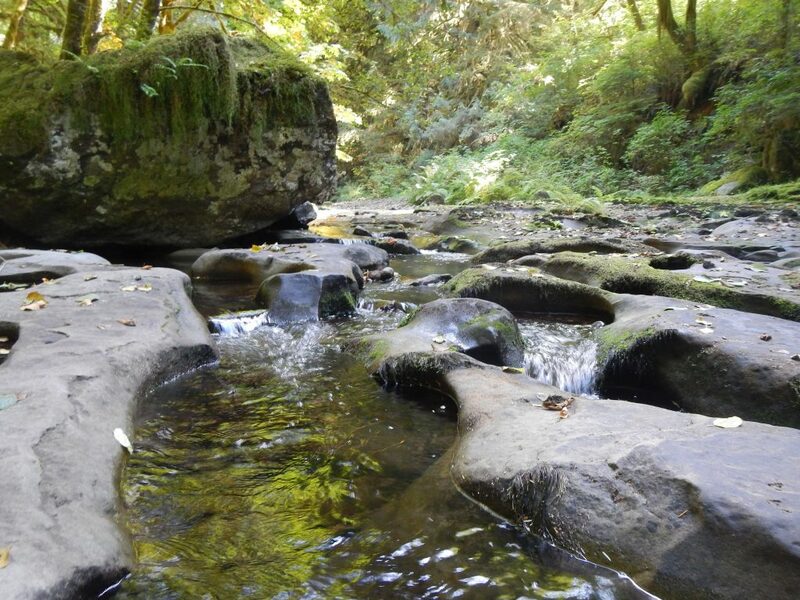 The flowing water had carved bowls, pools, potholes and cliffs into the bedrock beneath the river. It was unreal. I wandered around, walking from rock to rock, observing all the shapes and patterns carved into the rock. The gentle flow of the water created a lovely background of white noise. No one else was around. I felt like I’d stumbled into a private sanctuary. True bliss. I scouted out a resting spot and there I sat, taking it all in, savoring this time and place, alone in the river. Nature is powerful. This was a particularly moving place for me. I was tempted to never share pictures, never write about it, never draw attention to it. But alas, here I am. Years later I still distinctly remember being here. There is something to be said about the feeling of discovering your own special place. Nothing in the book or Internet write-up mentioned the magic of this spot. Perhaps that was a good thing. My only hope is that people who come here leave with the same sense of wonder and joy that I did. That they refrain from carving their names into trees, stacking rocks, leaving trash, building fires or any other thing that people seemingly like to do. Just let it be, so someone else can be captivated by its un-scarred beauty. 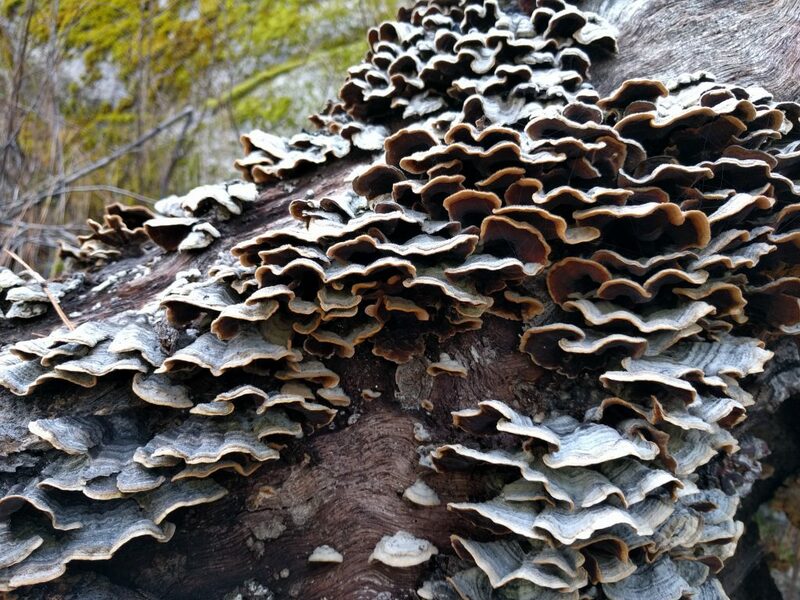 This entry was posted in Hiking, Oregon and tagged hike366 on March 28, 2018 by Jess B.
I put a Crack-in-the-Ground adventure on the Cascades Mountaineers Meetup group and got very few bites. I couldn’t tell if it was the timing, the driving distance, the fact that it wasn’t a mountain, or ??? that no one was interested in committing to this outing. In fact, the day before the trip I was down to just two participants, one being my husband. The other sent me an email and asked whether I was going to go with just the couple of us. “Heck yes!” I said. “I’d go if it was just me!” So, the three of us went. We drove out the night before to camp nearby. Luckily we had a Subaru to get us up the long gravel roads that were covered in snow. We cleared out a couple of spaces large enough for our tents and settled in for a cold but pleasant night. The next morning, after a nice breakfast, we packed up and headed for the trail head. All the information I’ve ever found about this place indicated that there’s about a mile to explore before heading back, but I knew from my previous trip here that this was not the case. We had a good day ahead of us. In the age of the Internet, there’s little left to the imagination. You can download GPS tracks, look at satellite imagery, read precise route directions, place yourself inside a 360 degree view and basically know everything you need to know before setting out. To me, this removes much of the joy of exploration. Sure, it’s nice to be able to do some research and plan ahead. But it’s also nice to be able to discover things as if you were the first person there. So I’m going to give you, the reader, that privilege here. Instead of writing a play-by-play, I’ll end with just a few teaser photos and some observations. The last time I’d visited this place is was much warmer. I underestimated how cold it would be, and how wet my feet would get. I was glad that I brought my headlamp. And running my GPS app was fun for marking points of interest but not necessary for navigation. If you can’t stay oriented with a giant crack in the ground, my friend, perhaps hiking is not the hobby for you. So go forth and explore. 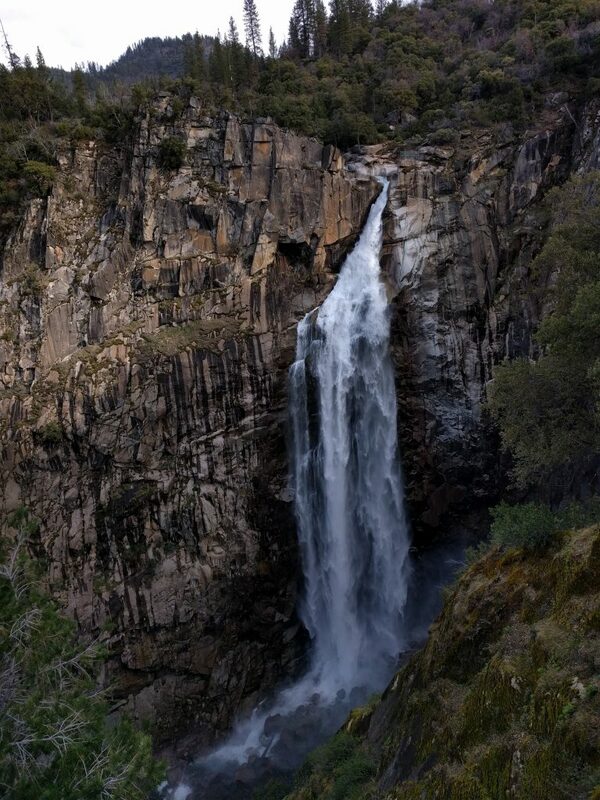 One last tip: give yourself more than an hour to visit this iconic Central Oregon landmark. 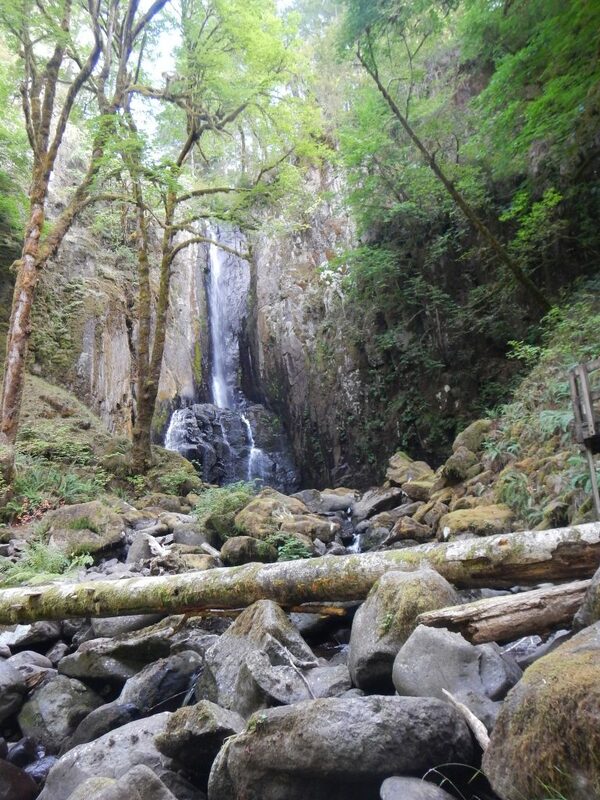 This entry was posted in Hiking, Oregon and tagged hike366 on March 5, 2018 by Jess B. 1.5 mi.| 500′ ele. gain | 1 hr. It’s like Pilot Butte, but a longer drive. That’s pretty much all you need to know about Bessie Butte. The elevation profile is pretty similar. The views are similar. The trail tread is pretty similar. There are two key differences: you won’t see many other people there and the summit is wild. No pavers, no mountain finder, no rock wall. Just a bunch of dust, scrub and fire-charred rocks. But, it was something different. For the Hike366 project I really wanted to show as few repeats as possible. I could have just hiked the River Trail, or clambered up Pilot Butte, or done any number of short, easy, in-town trails over and over again. But that didn’t feel right to me. So I sought out other locations to shake things up and at the same time broaden my local knowledge. Of course I turned to my pal Sarah, a long-time local, to share some of her wisdom with me. And the two of us met up today to hike up Pilot Butte’s cousin, Bessie. It was a really lousy day. The sky was saturated with clouds. It felt really gloomy and oppressive. What made the hike worth it was hanging out with Sarah and enjoying a slightly different perspective from this particular location. Will I rush back out to hike this butte any time soon? Probably not. But having experienced it once I feel at least educated enough to be able to talk about it and recommend it to others, or not! 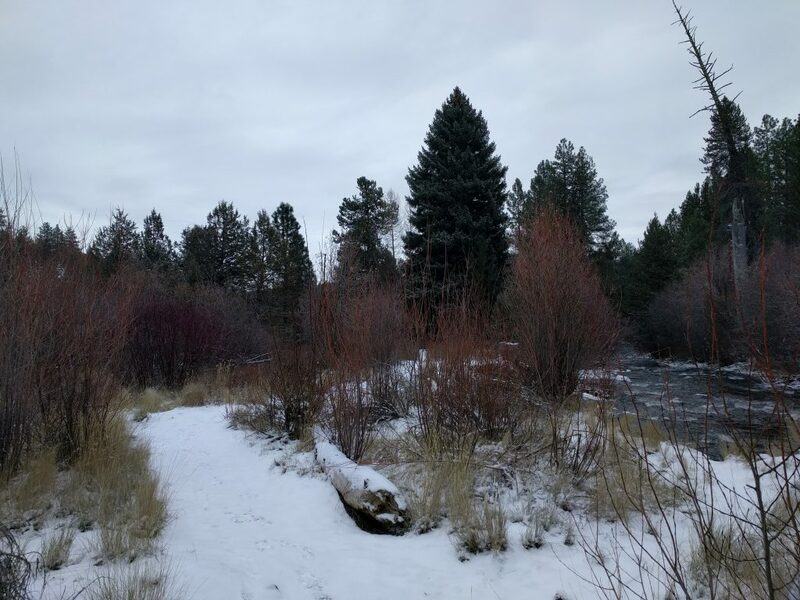 This entry was posted in Hiking, Oregon and tagged hike366 on February 21, 2018 by Jess B. It was, as the kids would say, cold AF today. But, it was a hike day and I had to get out there. 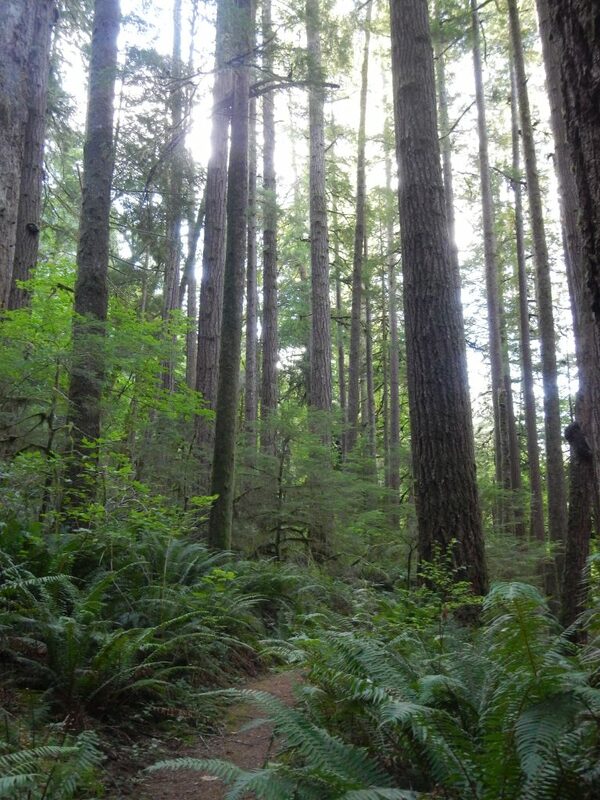 My map study led me to a section of Shevlin Park that I had yet to explore. It appeared that there was a trail along the creek, although I didn’t know how far it went or what my options would be from there. The best way to find out was to take a walk. I bundled up and drove across town. My tires crunched over last night’s snow coating the parking area. I cinched up my hoodie nice and tight. Did I mention it was cold? There was a signpost indicating a “Tumalo Creek Trail,” and there were even human footprints on it. 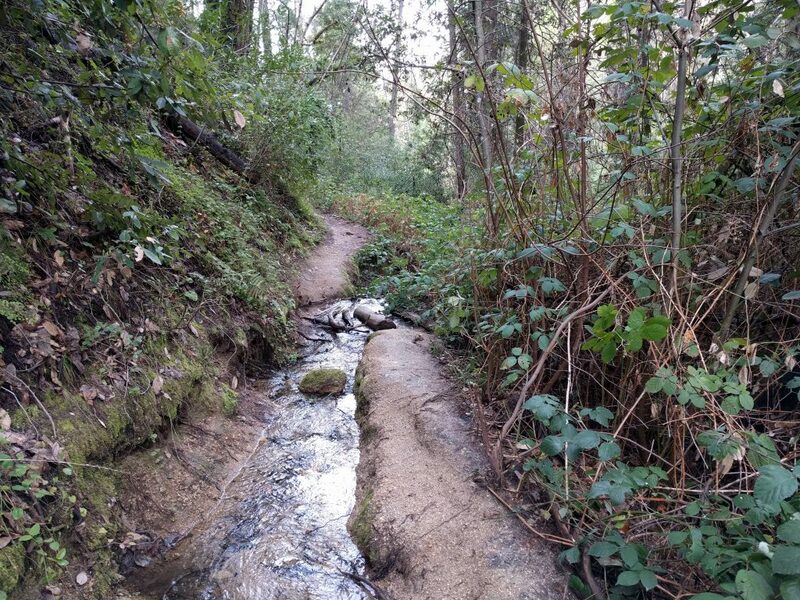 I walked the trail as it paralleled the creek, with red foliage brightening up the white and gray terrain around me. Soon I came to a gravel parking area and some kind of dam or water control system on the creek. The trail continued on, and so did I. The air was cold, but it was quiet. This stretch of trail was a bit off the radar for most of Bend, it would seem. And for good reason. The public right-of-way abruptly dead-ended after about a mile and a half, so I turned back. Brrr…I thought. No problem. On the walk back I examined the creek and all the cool ice sculptures that had formed on its edges. There was a benefit to enduring this cold air. These ephemeral artworks were only visible to those who braved the elements. I felt lucky to be there. In the end, it was only a 5K, but a nice one and I achieved my goal for the day, which was simply to get out and take a hike. Sometimes that’s all that I need to do. 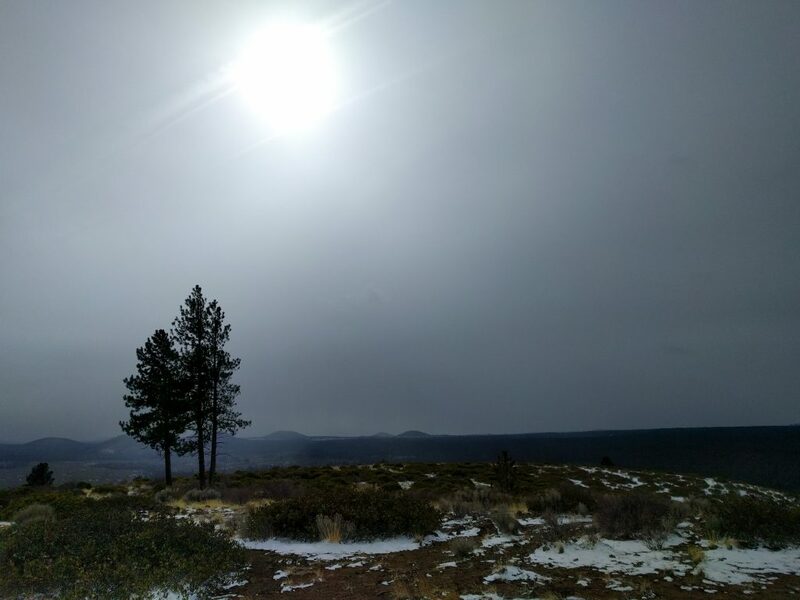 This entry was posted in Hiking, Oregon and tagged hike366 on February 20, 2018 by Jess B. Winter. It’s amazing. The air is cold. Snow flutters to the ground. The ground sparkles. Ice crystals decorate the edges of streams and lakes. But all these seasonal changes make it harder to access the high country. That forces me to be a bit more creative about finding places to walk. I’m not a good creature of habit; I like exploring new places. So when a friend mentioned the Tumalo Canal trail system, I said “huh?” And like that, I knew I had some Googling to do. 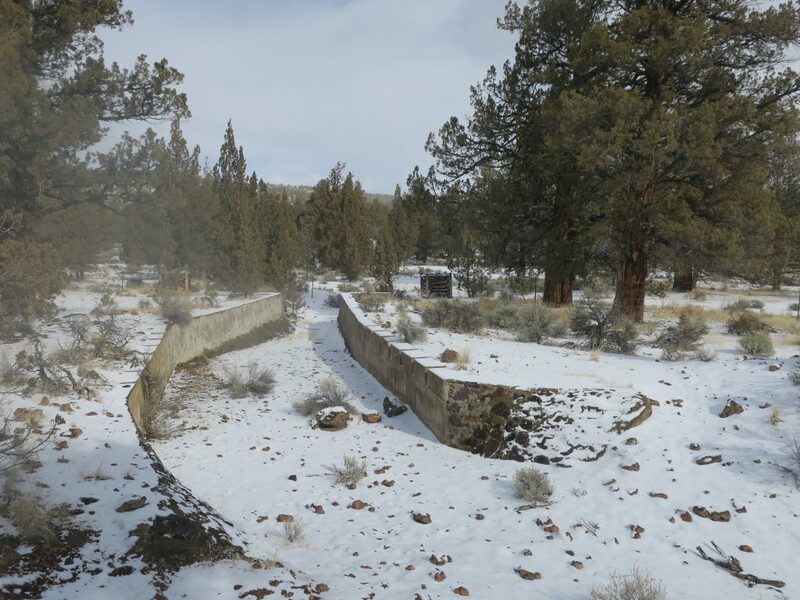 The Tumalo Canal Historic Area is a stretch of land managed by the Prineville BLM. The trails are open to walkers and/or horses but not bikes like the neighboring Maston area. A new place that’s close to home, with no mountain bikers and easy access in the winter? It sounded like something I needed to check out. I grabbed a map at the trailhead and headed off in to the snow. I was socked in with gray clouds. The area was classic high desert: juniper, sage and grasses. 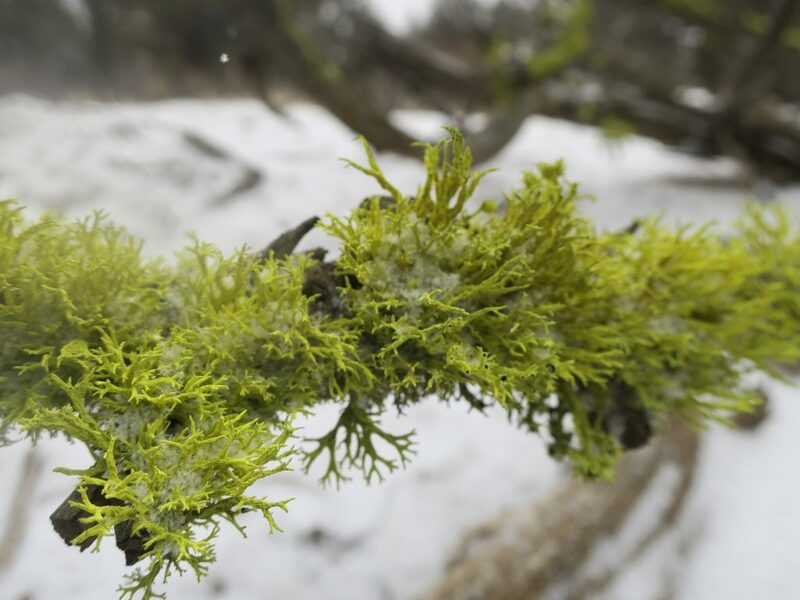 Impossibly bright splashes of green came from lichen clinging to tree branches. I trudged along in the gloom, snow pelting down from overhead. I passed one couple on their way back out. A patch of blue. The sky! It showed itself for a moment before covering back up again. I continued walking, trying to link up the numbered posts on the trail with the numbers on the map. I reached the old canal and confirmed my position, then kept walking. Some of the trail junctions were confusing. There were old roads and trails that weren’t well-marked, located right next to the ones that were. I got slightly discombobulated, then made my last turn for the stretch back home. Finally, the clouds began to part. The sun came out for good. Warm rays of light brought joy to my face. Ah, what a lovely feeling. I noticed all the colors and textures now. 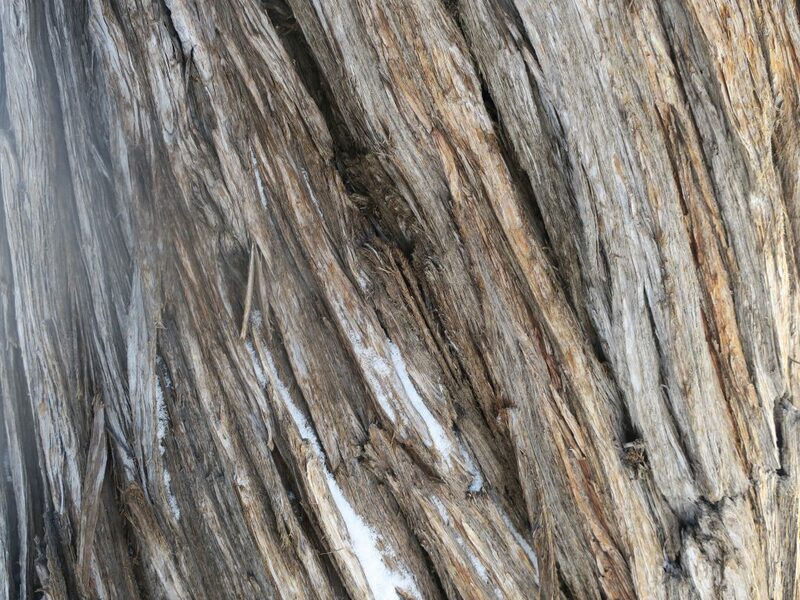 How the furrowed juniper bark swirled up from the ground towards the tips of each branch. How the yellow grasses caught the light just so. 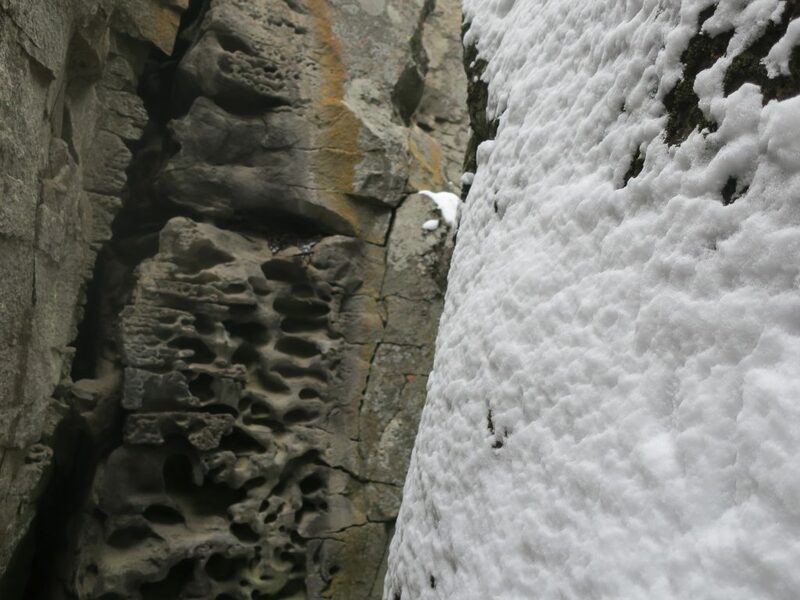 How the snowflakes rested on each micro-ledge of the rock cliffs. I walked slowly and intentionally, seeing so much more than I had before. There were no epic vistas, no challenging climbs, no major sights to see. But this simple little trail system brought me something that none of the dramatic Cascades Highway trails would: an opportunity to stretch my legs in the winter, and the space to stop and look at all the little treasures that nature had to offer. 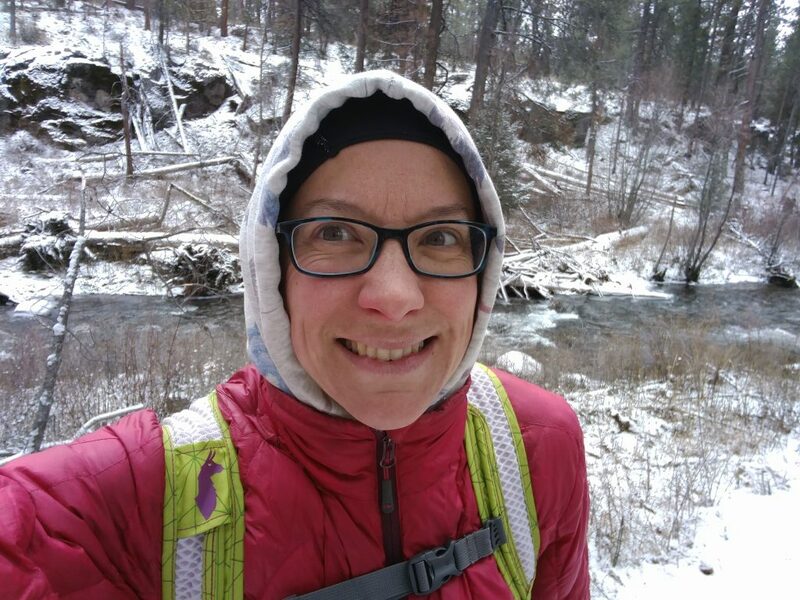 This entry was posted in Hiking, Oregon and tagged hike366 on February 19, 2018 by Jess B.